When a company makes the choice to manufacture in America they need to prioritize efficiency to survive; Omega Pacific has taken this challenge head-on. Alongside Chouinard and SMC, Omega Pacific was one of the first companies to manufacture carabiners in the United States. Now, just over 30 years old, they exceed 60 full-time employees and still make most of their gear in the U.S.
To find the Omega Pacific headquarters, drive outside the industrial city of Spokane, Washington, to Airway Heights. As you walk in the front door, your typical American manufacturing expectations will be met: Sign in at the front desk, find the tour guide (the welcoming Jon Jonckers), listen to a company overview in front of a typical looking conference room and acquire the requisite safety glasses. Quickly, the tour will shift gears as Jon wastes no time getting to the manufacturing floor and this is where it get’s interesting. You’ll see the inner workings of how Omega has continued to successfully grow a manufacturing company in America. By sourcing domestically, Omega ensures the highest quality material. Omega’s stock metal comes from North America (mostly from the East Coast), and other components, like springs, come from the Midwest. In 1995 Omega was one of a few companies to partner with a local medium security correctional facility. Inmates made carabiners for roughly 10 years until the program was shut down (due to a legality concern with the Washington State Constitution, all Washington corporations working with the prison system were halted by court order). During that time, workers “inside” received the same wages as they would “outside” and gained many skills. The program also encouraged good behavior in the prison because the Omega job was coveted, and there was a lengthy waiting list for the next position. Sometimes this may mean hiring robots. These robots might be expensive and complex to set up initially, but they don’t take coffee breaks, or call in sick, and they never get bored with a monotonous job. Often robots can improve factory safety, as they decrease the number of soft human fingers near sharp, heavy machinery. Omega’s use of high-tech robots is at the forefront of innovation in US manufacturing, just like a Ford factory. The complex robotics are top secret, but to give an example: Omega has one whose job is to carry out 3 specialized steps in a single operation. Need a jig to hold/shape/cut/punch a carabiner? Omega makes these tools in-house to ensure they have complete control over the process and quality. The photo above shows an employee using a machine that flattens the heads of the pins holding the gate to the carabiner. In use, it looks like a maniacal airplane pilot flying through a storm, quickly shifting the machine handles back and forth. The only steps that are done off the Omega premises, at local suppliers, are anodization (a chemical process that colors the metal) and heat treatment (precise heating to increase strength). Both jobs are still done in the Northwest. Normally, carabiner bodies are cut from 12 foot long straight metal rods and there’s leftover material on each rod that is too short to become a carabiner. Omega uses large spools of rod. By using a spool, there is only one leftover end for hundreds of feet of aluminum versus 1 leftover scrap per 12 foot rod. Omega also buys extruded bars (think: shaped metal rods) for their cam heads and Wedgies (their name for climbing nuts) instead of CNC machining them from solid blocks, saving tons of scrap metal. Catch any problems before the product is finalized (and an entire batch potentially compromised) by continuously conducting lots of tests like: measuring with calipers and gauges, human examination, and break-to-failure tests for every batch. Quality checks are standard in the industry, but companies like Omega have additional checks (not required for any certifications) along the way, and keep very thorough documentation of this. In addition to the frequent quality checks, Omega saves 5 carabiners from each stamped batch (identifying numbers are stamped very early in the production process) to store in their archive. 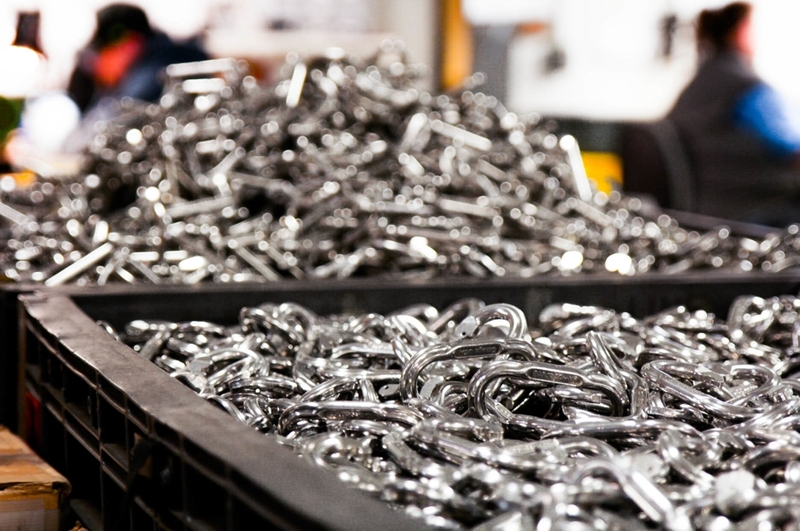 Every carabiner is tied to a specific lot that can be traced to exactly when the carabiner was made and from which lot of raw material. Omega collaborates with dozens of climbing ambassadors. They have also been involved in the Access Fund since it started. Check out the Access Fund Holiday Gift Packages available every November – there’s an Omega Pacific carabiner in each one. You have to be smart to manufacture climbing gear in the US. Manufacturing is always tough, but to do it in the U.S. a company needs to offset the higher cost of labor to stay competitive. All the small improvements in efficiency are crucial to long-term success. In addition to selling carabiners to rock climbers and rescue technicians, Omega Pacific supplies more carabiners to the military than any other climbing manufacturer. They continue to partner with lots of different folks including CMC Rescue, Stansport, Black Hawk, and even NASA. Despite challenges facing American manufacturers, Omega Pacific is doing really well. By sourcing locally, balancing in-house and contracted parts, and keeping high quality control, Omega Pacific has garnered a trust that’s essential for a company making life-trusting gear. It’s uplifting to know they’re able to keep almost all production in America while they sell to companies around the world. Photos courtesy of Michael Lane from Omega Pacific and WeighMyRack. Omega is awesome! In the trad climbing world, Omega’s Link Cams have been a fantastic contribution. Known to most climbers as the Oh S%#t! Cam, these innovative pieces are great when you need a piece fast, great way to travel light during simul-climbs, or just about anything. My husband and I opened a rock climbing guide service in Joshua Tree, California, where the crack climbing is tough and often run out. One of the first things we did was double up on our link cams! Go Omega!